On cold wintery days, it's nice to have a supply of hot sandwich recipes. I'm always stumped for lunch ideas. 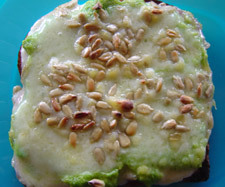 This Avocado-Cheese Melt is just the thing! This recipe makes two plump and loaded open-faced sandwiches - just the way I like them. If you (like my husband) prefer a thinner layer of filling, you can make three or four sandwiches instead of just two! Scoop the flesh into a bowl and mash it with a fork. Add the lemon juice and the salt. Put the bread slices on the cookie sheet. Spread each slice of bread with a thin layer of cottage cheese. Top with the avocado mixture and spread it evenly. Top with the sliced cheese. Use freshly squeezed lemon juice instead of bottled. Use another type of bread instead of whole wheat - or use a sliced bun, croissant, bagel, or English muffin. Use sesame seeds instead of - or as well as - the sunflower seeds. Or how about trying pumpkin seeds? Use another type of meltable cheese in place of the Cheddar. How about Swiss, or mozzarella? Leave out the cottage cheese if you like. What other flavorings would you like to add? How about a thin layer of salsa on the bread? Be sure that your avocado is perfectly ripe. Hold it in your palm and give a gentle squeeze. It should feel firm, but should give gently to pressure. It shouldn't feel mushy, but it shouldn't feel hard as a rock either. To speed up the ripening of an avocado, put it in a paper bag and keep it at room temperature. To slow it down, place it in the fridge. For more very quick meals, see my cookbooklet, "Last Minute Meals". Return from hot sandwich recipes to lunch ideas.